A few days ago Beena a food blogger like me, posted vegetable cutlets and immediately it brought back some fond memories of Mangalore. Ajay went to Mangalore for his post grad course and I stayed back in Mombasa with my in laws. During my short visit to the coastal town, Ajay took me to all the famous food places that students frequent in Mangalore, dosa place, ice cream place and a small restaurant where they made the yummiest vegetable cutlets. Unfortunately, we both cannot remember the name of the place. So when I showed him Beena’s post, he insisted I make some of the cutlets and with a coating of semolina instead of bread crumbs just like the restaurant. Beena thanks for the guideline and bringing back fond memories. I made a few changes to the recipe to suit our taste buds and I had some boiled beetroot ready in the fridge. The cutlets turned out good and it will be on my menu when I have guests over next time. 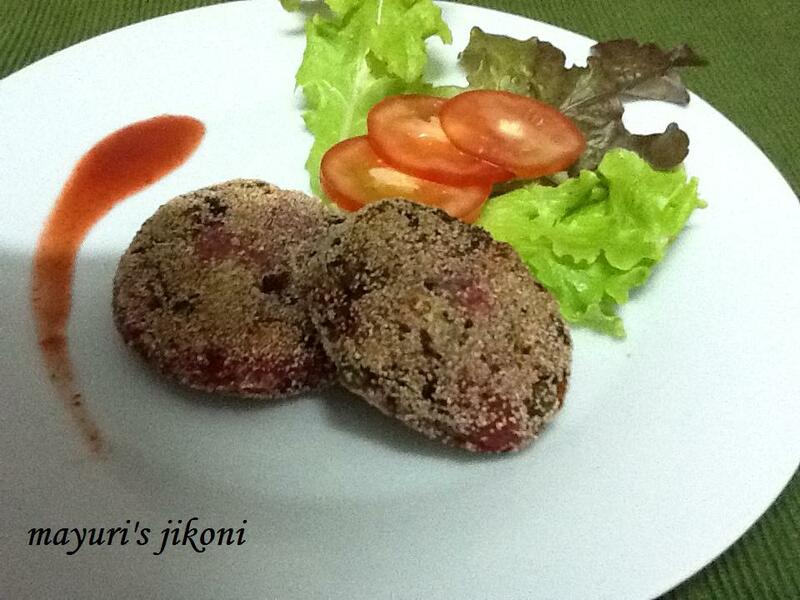 As for those of you who love cooking non vegetarian and vegetarian dishes, visit Beena’s blog. Just click on her name. Put the mashed potatoes in a big bowl. Add beetroot, peas, chillis, ginger, salt,coriander, lemon juice, cornflour, onion and breadcrumbs to it. Grease a small tray or plate with oil. Grease your hands lightly. Divide the mixture into 10 parts. Take each part and roll it into a ball. Gently press it between your palms to get a disc. Shape it properly and keep it on the greased tray. At this point you can leave the cutlets in the fridge (cover the tray with cling film) till you need to cook them. Heat a shallow frying pan over medium flame. Add oil to it about an inch deep or less. Let the oil become hot. Roll the cutlet in semolina till it is coated completely. Place it gently in the hot oil gently. Place about 4 to 5 of them. Let the underside get cooked till it is light golden in colour. Gently flip it over and let the other side cook. Serve immediately with your favourite chutney, chilli sauce or tomato ketchup. Use chopped chillis if you like. You could add other vegetables like carrots, corn to the above mixture. Use breadcrumbs instead of semolina as Beena has done.